Nursery, horticultural or plant labels are extremely useful identification techniques for all types of flora. They are used in nurseries, conservation areas, farms and domestic gardens as a vibrant addition to the natural environment as well as a useful educational tool and vital marker for plant identification. Nursery tags and plant labels have to withstand exposure to a variety of weather types for long periods of time without destroying the wording on the label. This means that the label must be manufactured out of a hardwearing, weather-proof material with weather-resistant marking. Similar to an ice-cream stick, these rigid, elongated labels are generally made from a hard plastic with a pointed end that can be inserted into soil. A permanent marker can be used to identify the plant types and labels can come in a range of colours to make identification easier – and more vibrant! These are suited to pot plants, fertilisers or seed trays. These can also be used for pot plants or seed trays and consist of a rectangle space for labelling and a pointed end for inserting in soil. The benefit of T-stakes is that the plant identification can be written horizontally which makes for easier reading. 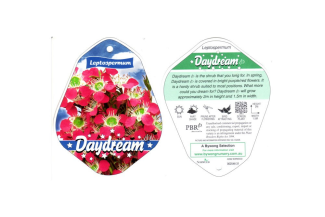 They also come in a range of sizes with the smaller labels ideal for seed trays or shallow pots. These come as elongated sticks or even T-label design and can be written on firmly in pencil. The writing can be removed with a bit of sandpaper and the advantage of these labels is their natural aesthetic that works really well in a garden setting. These plastic tags slip over themselves to fasten and will remain in place despite all weather conditions. Thermal printing onto the tags will provide professional identification of plant types which cannot be removed, and won’t fade over time. These are suited to a variety of flowering plants or bushes, are very easy to fasten and extremely durable. Similar to the stick labels, the pot tags are plastic elongated sticks with a sharpened end that can be inserted into seed trays and pot plants for identification. Thermal pre-printing of plant identification allows for longevity and a professional appearance. They come in a range of sizes suited to different horticultural needs. This clever design allows for a tag to easily hang onto the branch of a tree, stem of a flowering plant or attach itself to any hanging pot plant for easy identification. Once again, the tag can use thermal printing to prevent any weathering or fading. These are particularly strong labels designed in a tough material using an aggressive adhesive and top-coated face stock to resist water and sunlight. They can be applied to smooth, damp surfaces which make them perfect for labelling pot plants or seed trays. A very trendy nursery label type is the blackboard stake, similar to wooden or plastic T-stakes, but made from heavy-duty polypropylene. These can be marked using waterproof pens with isopropyl alcohol to remove the wording if necessary. These are great in pot plants and herb gardens. A fairly new label type is the printed tree wrap which wraps around the plant and adheres to itself. These can be printed in a variety of colours, with a company logo or message clearly printed. It’s eye-catching signage that is easily adhered to a young tree. These are used for identification of trees that need to be removed, protected or treated, as well as identifying various species or memorial trees. They’re used by government departments, researchers, farmers and landscapers and come in a variety of materials and sizes. There really are vast range of plant labels, tags and signs for the horticultural industry and you’re sure to find exactly what you need for every flower, tree or bushel – just ensure the material used is hardwearing so you’re not having to replace them every few months. For all your plant label and nursery label requirements, contact a leader in the label manufacturing industry. Rebsons Labels is a leading supplier of labels in South Africa and produce self-adhesive labels for local and international clientele from various industries. For the highest quality label manufacturing for your product through either digital label printing or traditional label printing contact Rebsons Labels today to discuss your needs.